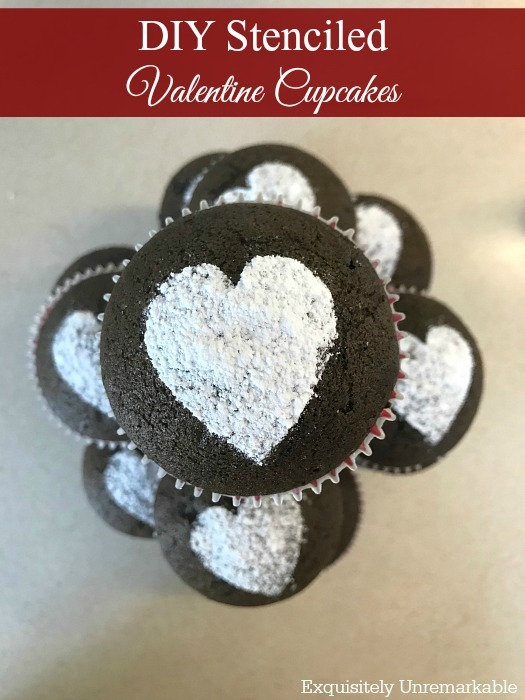 Whip up these delicious eggless Valentine cupcakes with an easy to make stencil and some powdered sugar. 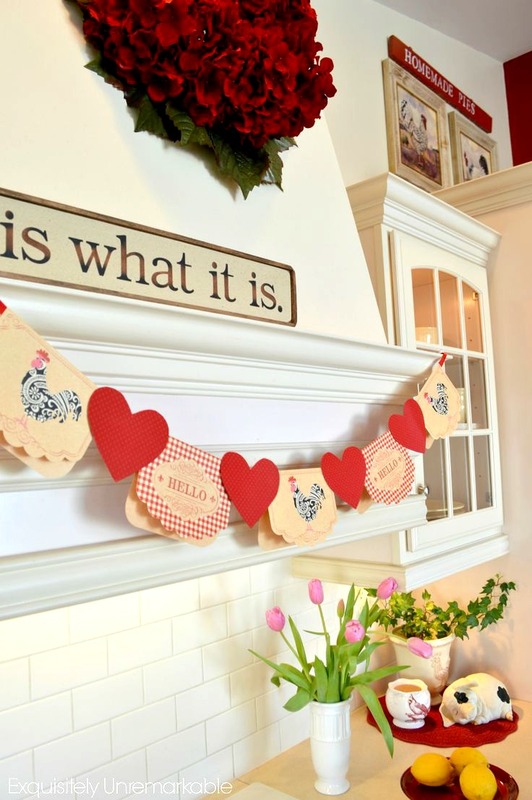 It's a super simple way to show your family a little bit of love that won't break the bank! Hello friends. Today, I'd like to share a little bit of love with you, some really sweet Valentine cupcakes. Yesterday I was certain that I would not be posting this week at all, but this morning when I woke up and the crowds were gone and the house was quiet ~ too quiet ~ I felt the need to be busy. I needed to do things to keep me from thinking too much and I needed something to fill up the time I would normally be visiting my mom. So once again, it was crafting to the rescue. 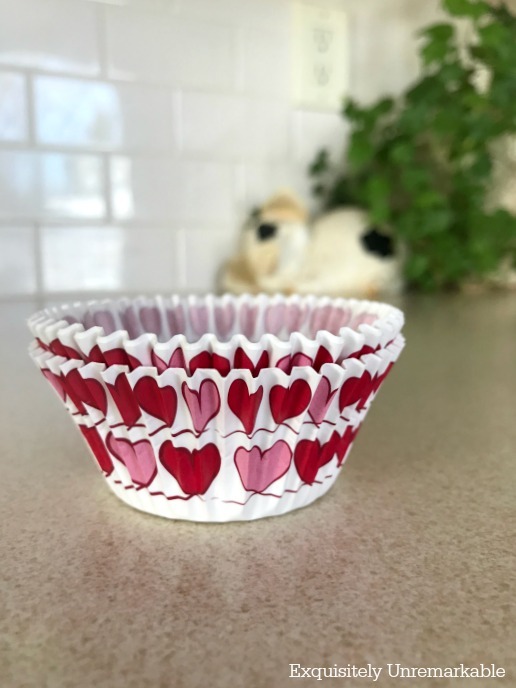 I figured since it was almost Valentine's Day I would whip up some cupcakes with the heart covered liners I picked up last week at Michael's for less than two bucks. I also knew that everyone around here could use a little bit of sweetness today. The cupcake recipe itself is not mine. That's probably why it's so delicious. There are no eggs, which is perfect for my vegans, but you'd never know it. It's the best chocolate cake, period, that I have tasted in a really long time. I think I've made it four or five times since Christmas and it disappears within minutes of leaving the oven. Of course, I couldn't just leave those cupcakes unadorned. I mean what's Valentine's Day without a few hearts? Now we all know I am a lazy cook and crafter, so there wasn't going to be any fondant or glaze or even homemade icing. At least not today. But powdered sugar? I could handle that. I didn't have a heart stencil on hand, so I made one out of an index card. I just cut out my heart, placed it over my cupcake and sprinkled the powdered sugar on with a flour sifter. I frankly couldn't believe I owned one, but there it was in the cabinet. It made the process super simple and my cupcakes super stunning. It also added a tiny smile to the day. And boy, we all really needed it. Now for a few more smiles ~ it's time for Ten on the 10th! Make sure you check out all the other fabulous Valentine ideas. These ladies are talented, you don't want to miss a post. Here are a few more Valentine ideas. Love your cupcake decorating! This would be such a solution for classroom parties where the icing is such a mess and the kids eat too much sugar. Pinning for sure. As a former teacher of the little ones, I totally agree! It's so easy they could even make their own stencils. Thanks for the visit and the pin! Those cupcakes look delicious! I'm not a baker, but you have inspired me. The stencil idea is genius. Thank you for the inspiration! These are really cute Kim. I like the idea of no frosting and still adding some sweetness to a cupcake. These would be so cute on a brownie too. Hmmmm I think I might have to make some cupcakes! Glad you are doing a little better each day with losing your precious mom. Keeping good thoughts for you as you grieve. (((((((Kim))))))) Your cupcakes look delicious and using a note card as a stencil is sheer genius. Thank you for sharing these with us all. Very nice. Your cupcakes look so fun on your rack. I have done a ton of baking but never tried to stencil with powdered sugar. Very clever. I hear you about the time to fill up. When my grandma was in the nursing home my folks would stop nearly every evening and spend an hour or so with her. When she was gone that hour of time was one of the most noticeable reminders. It was such an ingrained part of their daily schedule to head to the nursing home. 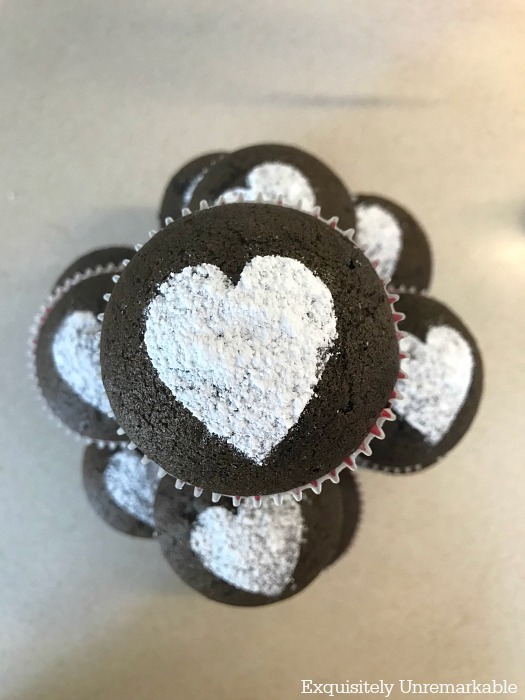 I loved your Heart Cupcakes . . .
A sweet thought from your heart. Kim, I'm so very sorry for the loss of your Mom. May your happy memories bring peace and comfort to your broken heart. After the loss of my son, keeping busy was what I needed and I completely understand your need to get crafty. You did an awesome job with these cupcakes. Many hugs. I'm so sorry about your mom. Blessings to you and your family. These cupcakes are adorable. The stencil idea is a fabulous one. My prayers will be with you in the coming days. Thank you so much, Katie. I really appreciate the kind words…and the cupcakes were super easy to make. I’m glad you like them! Those cupcakes look super yummy and you know I'll definitely be sharing them with the resident baker in the house. I think your pretty stencil adds such a lovely touch! Oh, I’d love to see what your baker will come up with, Mary!! These are absolutely so nifty and pretty! I love a cupcake without the gooey frosting, and especially with the grands toddling around. Goodness knows that frosting goes everywhere! Sometimes chocolate feeds the soul better than anything, and I think your sweet cupcakes did just that! so like you to smile and put your heart out there. and no pun intended. it's true! I would offer you one if there were any left, Patti, but like I said, they disappear pretty quickly around here. I guess that’s a good sign! I am so sorry for your loss. I completely understand the power of a project to ease grief. Your cupcakes are wonderful. I am not surprised. You are so talented. Oh they really look nice and tasty! I wouldn't have thought of making my own stencil, but it worked great, and I see you're using that nice little cupcake server thing. Perfect for them. Necessity is the mother of invention...as my own mother would've said. So I made a stencil. And yes! That cupcake server thing is proving to be one of my favorite thrift store finds. Who knew? Very sweet, and simple idea! Thank you, Deanna. And you're right...very simple and very sweet! Kim, I am going to try making these cupcakes today or tomorrow. I need to make something for my brother-in-law's birthday dinner, and none of us need the extra sugar that's in frosting! I am so sorry to hear about your mother's passing. I will pray that you find solace in your beautiful memories of her. Thank you, Melanie. ❤️And those silly cupcakes really did help everyone in the house just a little bit. Thanks Lisa! And I got to use my thrifted cupcake holder. That little mystery item has turned out to be one of my favorite finds! Kim, I'm a sucker for cupcakes, especially chocolate. I'm all about the garnish and making them pretty and making a heart stencil was brilliant. 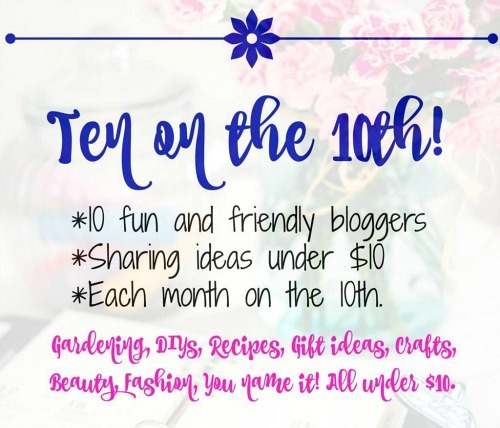 I hope that making them and the project and being a part of Ten on the 10th helped your week go a bit easier than the previous one. Loved your other Valentine's projects too. Thank you so much, Carol...and yes, busy hands are comforted hands, especially when they are busy making chocolate cupcakes. I like the idea of the cupcakes. My boys would like something simple like that as a decoration. Thank you, Carla! Extra hugs are welcome. And...those cupcakes are so easy to make, you boys would do a great job! Great idea to make your own stencil. I never would've thought of it, in fact, I would've just made a mess of it and sprinkled it all over. I’m usually the make a mess type, but this one turned out ok! School supplies and baking. Who knew? Thank Jan! Coming from you I take it as a high compliment. Thank you so much, Deb. I'm plodding through the days and I have to say, I have been overwhelmed by the kind comments and people who have reached out. I am so grateful and blessed. And don't believe the news, there is so much good in the world, so many wonderful people. Like yourself. I am so sorry to hear of the loss of your mother. Your brownies are so cute and make me want to bake today. But, we have a big event next week and I still want to shed 1 or 2 more pounds rather than gaining a few from eating a tray of brownies! Thanks so much, Carol. And I totally get it. My busy hands are keeping my head distracted, but my waistline is expanding. I am sorry for the loss of your mother, Kim. I love your cupcakes. Kisses, my friend. How cute! I think you need your own craft show on TV. I wish!! Although, I hate myself on camera. I’d love to write a book though! I love the added heart stencil! Thanks Jann! Easy to make, too. 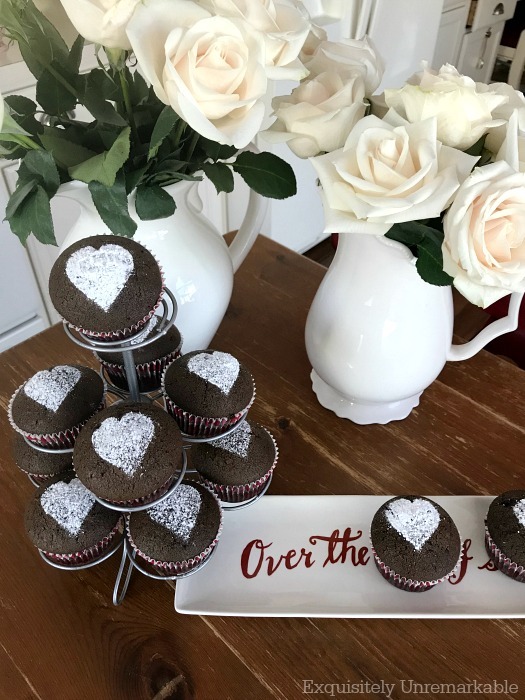 The cupcakes are so sweet and great idea in the heart stencil. It’s lovely. I have been thinking about you and wanted to see how you are. I’m praying for you. Hi Kim, I love the way you decorated the cup cakes with the powdered sugar and the stencil you made. Even I could do that one. You save money too without having to buy a stencil. I love this idea and will use this the next time I make cupcakes. Plus this was a great way to put a smile on everyones faces and I bet the cupcakes tastes great. Hope you are staying warm. Enjoy the weekend. The cupcakes were so good, Julie. That recipe is a winner and yes, the stencil was so easy and I look like a baking champ. Have as super Saturday! Thank you, Maria. I appreciate all of your kind words. I'm a huge fan of baking, especially when its cold outside. 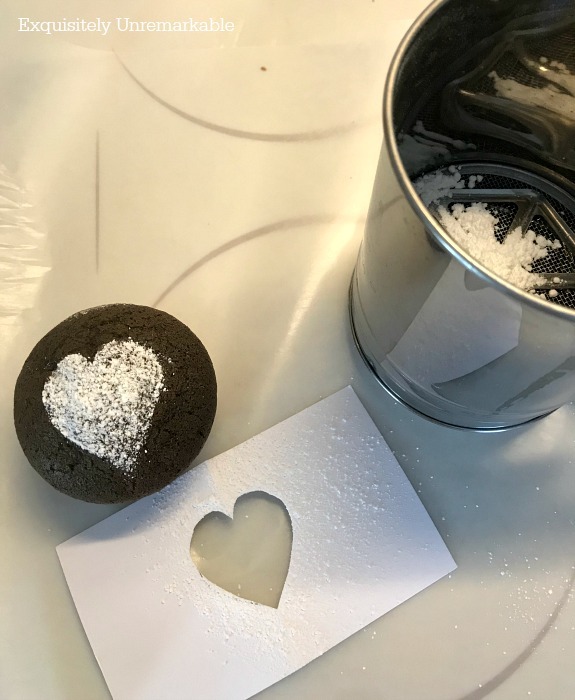 Your powdered sugar hearts are too cute! And so simple to make! Who needs glaze???? Take care, my friend. Thanks Audra! I am always taking the easy way out...crafting, decorating, baking. Especially baking!